Yang sudah buat berwarna PURPLE kesayangan. wohh banyaknya yang bukan PURPLE. since last ramadhan until my engagement day, i never go a day without it. i took at least a bottle of it everyday, at night before i went to sleep. at that time, i feel like i have treated my body really well. i didn't care about the "radiance and beauty from within" that have been promoted in the advert. or "say goodbye to dull complexion, sallow and lifeless skin" tagline. what i like about the product are the health benefits that it has to offer. -high fibre: helps you maintain a healthy digestive system and promote good bowel movement. -inulin and oligofructose: these highly effective prebiotics help improve digestion by promoting good intestinal bacteria and a healthier digestive system. -vitamin c: to help reproduce collagen for your skin's elasticity and youthful apperance. -iron: nourishes blood circulation by carrying more oxygen to the cells. -anti-oxidants: with twice as much antioxidants as other fruits, prune protect your body cells against free radical damage and, that helps delay the aging process so you'll look young and healthy. anyway, you can read more on the health benefits here. i think it works wonders in helping me doing my "business" every morning. and it actually made me feel great about myself. pathetic kan hihiks i know. since my e-day, i've stopped taking it because i have to save my money for other things that are much more important, e.g. barang hantaran. and now i feel really bad for not taking a good care of myself. i think i'll switch to prune juice since it is a cheaper option than the prune essence. i know that prune essence is more concentrated than ordinary prune juice. still, it is better than nothing, no? but i have to be extra careful in selecting the prune juice. there are so many prune juices in the market. most importantly, it has to be sugar- and preservative-free. apa la yang i membebel ni? are you one of those people who have struggled for a long time trying to lighten your body skin? you have spent hundreds or maybe thousands for a whitening body lotion, shower cream, or anything but you didn't get any satisfactory results. great news lovelies, now you can get your body skin lightened at minimal cost! you will feel great, safely and most importantly cheaply. seputeh kapas spa is now offering great deals for a whole body skin lightening treatment. normal price for the treatment is rm200, but for now until 31st december 2010, you can purchase voucher for a session of whole body skin lightening treatment at only rm100. what a wow, 50% discounts! with guaranteed instant results, your skin will be at least one shade lighter with only one session. natural fairness, with no burning, irritation or harsh smell. voucher(s) can be redeemed from 1st january 2011 until 30th june 2011.
so you have 6 months, you can actually purchase more than a voucher, girls. be smart and don't miss this one time limited offer. 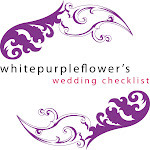 b2b readers, have you start preparing the guest list for your wedding? well, it is the first step in planning a successful wedding. it is so much important to determine how many people will be invited to the wedding, since the size will affect the overall wedding expenses. first and foremost, start by setting a goal for the list size, which basically base on the budget and not to forget the space that you have. then, ask your parents and family members to help you in building the list. 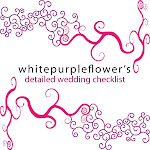 to make it easier, categorize your list into few categories - e.g. relatives, parents' friends, neighbours, friends, siblings' friends, etc. 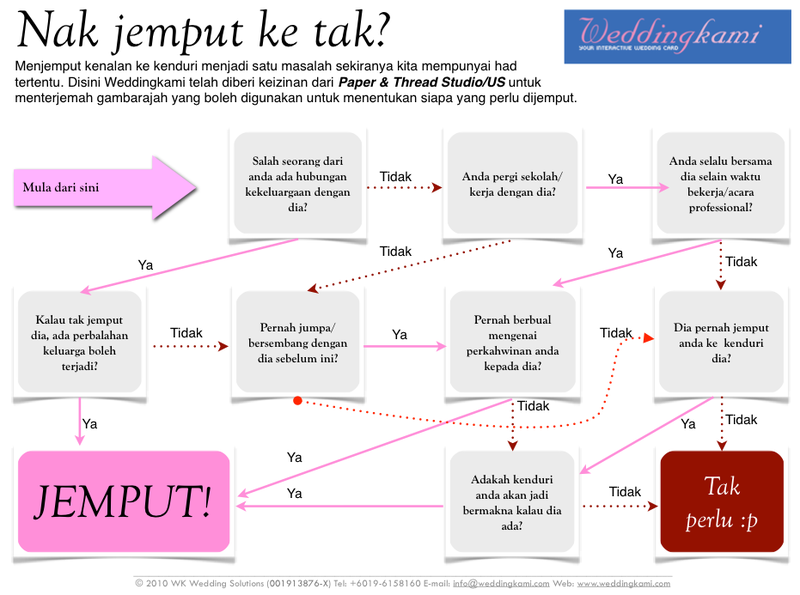 please know that in general people will attend your wedding in groups - e.g. with kids for the parents - so don't forget to multiply the names with 3.
normally, one quarter of those invited will not attend. so basically you can invite more people but not too many. after that, sum up the names and compare the number with the goal. e.g. you expect 1000 pax of attendances. so number of invites = 1000 / 2.25 = 444 to 445.
usually occurs, you have to narrow down the list, which you may need to eliminate some of the names. narrowing down the guest list will be one of the most challenging tasks. rule of thumb, save the spots for the most important people in your life. mungkin gambarajah di bawah dapat membantu. taking advantage of the year end sale, we already bought some stuffs for the wedding hantaran. as decided by both parties, wedding hantaran will be 5 trays from him, which will be reciprocated with 7 trays from me. anyway here's the list (wedding ring and maskahwin are not included). 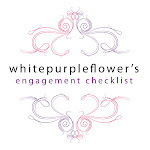 changes or updates to the list may occur without notice. he asked for a ps3, in which i reluctantly agree. nak kahwin ke nak main game? haha kejam. even if he really wants, no need to make it as one of the hantarans. make it as a birthday gift pun okay kan.
sebab kalau jadi hantaran, mula-mula kahwin dah sibuk main ps3. nak mimpi pelamin ni. bye. lovelies, i have a perfume for sale. it is boss orange perfume for women by hugo boss (75ml). it is new and 100% authentic. comes in a box with plastic wrapping. top notes - apple, peach, orange blossom, plum, jasmine. base notes - cinnamon, vanilla cream, sandalwood, olive wood. top notes describe strong personality of a woman, her enthusiasm and energy. notes of sweet apple reveal the first, delicate taste of feminine passions, adding a floral, soft and charming heart. white flowers, which are tame and gentle, are mixed with orange blossom, giving an optimistic impression. a base includes sandalwood, olive wood and creamy vanilla, which make the finish very characteristic, passionate and warm. described as a woody oriental, the fragrance is soft and comfortable, with rich fruity undertones. edition for women boss orange attracted our attention with its advertising face, actress sienna miller, which represents urban, natural, modern woman searching for a feminine fragrance, completing her spring image with cheerful aromas. beautiful, intriguing, free, charismatic and spontaneous boss woman is represented perfectly with aromas of boss orange. my price is rm150 only including poslaju. psss.. my friend is working with a cosmetics & fragrances department in a department store. and he can get great discounts on certain items. if you wish to buy any perfume, email me at aishah_ara@yahoo.co.uk. i'll ask him for the price and will inform it to you. if you wish to purchase, i'll get it from him and send it to you. don't worry, i can guarantee that the perfumes are 100% original and authentic. girls, i decided to SELL or RENT out my engagement outfits. our wedding outfits too! check this out ---> our wedding attires are up for rent! 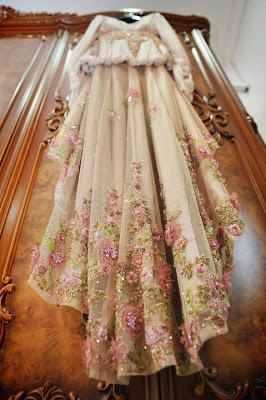 1) my blush pink/purple lace dress + lace embellished chiffon silk veil - SOLD! email me at aishah_ara@yahoo.co.uk if you girls are interested with any of these. do not raise the volume of your speaker. this slideshow comes with no background music. originally, i put the audio track of 'bruno mars - just the way you are' as the background music for the slideshow. unfortunately, it has been disabled by youtube due to copyright issue. i love that song so much so i decided not to do audio swap and just let the slideshow run without any background music. ohh please no.. i dah muak baca pasal cerita tunang dia. kah kah kah padan muka i.
excuse me, this is my blog. so it is 'my place' and kind of a diary for me. i hope you don't mind when i am still writing about my engagement. anyway, i am waiting for my photobook be ready to be picked up. i opted for 15" x 11" large landscape imagewrap photobook from photobook.com.my. i just ordered it yesterday, so i guess it will be ready by next monday or tuesday. but this time i am not going to write about the same official photographer. did i tell you that we have two teams of official photographer during my engagement? the other one was from annis imaging resources sdn bhd. i know that you never heard about them. mereka adalah otai-otai photography yang klasik. they are official photographer for 2001 XXI sea games, the premier cup series 2000, prominent golf tournaments, langkawi international dialogue (LID), national smart partnerships dialogue (NSPD), MIGHT consultation, economic planning unit (EPU), of the prime minister's department, the convocation ceremony of the various governments and public learning institutions, and so forth. klasik sangat tau semua projek-projek yang serius je. mereka adalah kawan kepada bakal mertua i.
hence, they were hired to be the official photographer and videographer for the event. willy-nilly i redha je, lagipun i pun dah ada avicenna kan.
plus, i dapat videographer yang asalnya tak termasuk dalam budget i pun. and now the storybook and the video are ready. overall, the pictures are good. i guess my parents will like them. but personally, i think they are a bit classic. kenapa klasik? okay tengok ni. tapi sebab they all biasa ambil gambar untuk sukan, istana and lain-lain event serius, so gambar-gambar suasana memang sangat spectacular. no, i don't exaggerate, seriously they are. the pictures are very, very crisp and clear. whaddahek minah ni cakap pasal suasana pastu letak gambar dia jugakk. okay okay i bagi contoh suasana. and same goes to the video, vivid and sharp. the edited video is around 40 minutes, and i have no montage to be shown. the selection of song did make me laugh out loud, haha, sorry uncle! but again, i guess my parents will love it. next, stay tune for my post-engagement pictures slideshow. my BFF, ieja, will be getting married in a week time! i've known ieja for more than 10 years now but she never been happier. i yang bukan nak kahwin pun ikut sama-sama excited juga. well, i kan MOH kena la excited kan.
i'd like to congratulate ieja and unos in advance and want to thank ieja for asking me to be part of her special day. ohh the day came so quickly. i feel that it was only months away since i met unos for the first time. the first time i saw ieja and unos together, i knew that he is the one for her. with unos, she was a different person, happier and more in love than she was with her old boyfriends. you know, she had such a sparkle in her eyes and her face was glowing, well things like that. their personalities really compliment each other. and they look perfect together. ohh my, starting next week my BFF is not going to be single anymore. it's about the end of ieja's single days but nevermind, there is a beginning with every ending. it may certainly will change something but it will not change the nature of our friendship. by the way, i am so much looking forward to the new experiences that we will share in the future. so ieja and unos, again, congratulations on a wonderful future together. merasa i pakai baju dari altelia amani untuk majlis kat hotel hihiks. ohh i can't help myself. was blog hopping until i stopped by bitsANDpieces' blog. 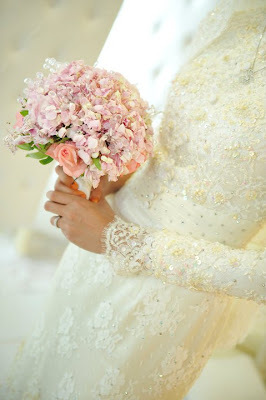 her solemnization outfit is seriously superb. and her wedding dress is superbly extraordinaire. i don't know how to put it in words. but they are just amazing. both outfits are from sharifah kirana. ohh and speaking about outfits, i heart syomir izwa's too. ohh god, she's a genius. last tuesday was a public holiday when i decided to tidy up my room. it was almost a month since my e-day but the goods from that day are not yet packed or kept or cleaned up. not that i didn't have time but well, i just being lazy hihi. i have lots of flowers from my e-day that are ready to be used again. since my book rack previously was kind of boring. i decided to give it a little touch up using those flowers from my e-day. and since i already finished my studies, i can now store all my books in a storage box without feeling guilty. flowers really can bring a room to life, be it fresh or artificial ones. and this is the end result, which i really like. paling suka idea d.i.y. flower frame from aty. i got 5 trays from his side, so i gave him 7 trays. arrangements were done by yours truly for my side and by his mom & aunts for his. sekarang waktu yang sesuai untuk beli barang hantaran kahwin pula sebab tengah year end sale!